To Cite: Pedram P, Ghadirian H, Arab S. Anterior Teeth Splint with Various Degrees of Alveolar Bone Loss; A 3D Finite Element Study, Iran J Ortho. Online ahead of Print ; 13(2):e7981. doi: 10.5812/ijo.7981. Background: Splinting anterior teeth is a way to fix them after orthodontics treatments. Occlusal trauma from functional or parafunctional forces can cause stress increase and movements of teeth especially while having bone loss. 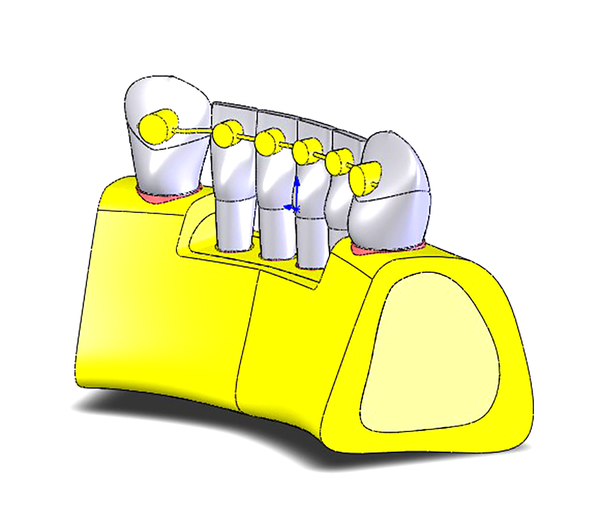 Methods: Six anterior teeth with different bone levels were designed in SolidWorks (2010), the models were then transferred to ANSYS Workbench 12.1. The models were loaded with 187 N force on the incisal edges of two incisors. Results: Stress on canine was 0.45 MPa in normal bone height and increased to 0.60 MPa in five millimeters of anterior teeth bone loss. Labial displacement was less in normal alveolar bone height while it was increased in all those teeth with five millimeter of bone loss. Conclusions: Splinting distribute the forces between teeth and the stress production on canine increase while it splinted with low level bone incisors. Anterior teeth also showed tipping movements in reply to increased forces. Tooth retention has been suggested by several researchers after orthodontic treatments. It can be explained as kipping the teeth in the best esthetic and functional places. Splinting as a prohibiting way for relapse after the orthodontic treatment which is completely cared by orthodontists. 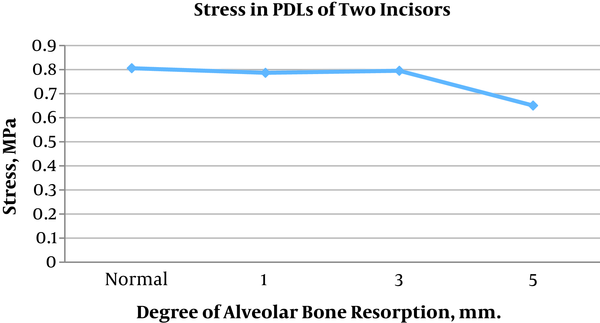 PDL reorganization is needed to let alveolar bone remodeling while soft tissue pressure is under control by appropriate retention (1, 2). Splinting teeth to each other let them support the weakened teeth, by means of fixed or removable restorations or devices. Another indication for splinting is a patient with mobile teeth as a result of bone loss and reduced periodontium. Attachment apparatus can be damaged by occlusal trauma which is a force to the periodontium from functional or parafunctional habits (3). There are some other factors due to tooth mobility, include: The distribution of teeth in the arch, alveolar bone levels, number and forms of the roots, root length, root proximity, and inter-radicular bone. Tooth migration is usually caused by periodontal problems such as inflammation and attachment loss. Anterior teeth are very susceptible to displacement as there is no occlusal force and anterior-posterior contacts to protect them from migration (4). One indication for splinting is a mobile tooth as a result of alveolar bone loss, and secondary occlusal trauma. The tooth can be stabled and the mobility decreased by splinting. The ideal splint should distribute all occlusal forces to a larger number of teeth due to prevent tooth movements, and stabilize periodontally weakened teeth. A patient-based study was done to assess the effect of splinting which showed that splinting can decrease the periodontal load on teeth with reduced periodontal support, but may increase the load on the splinted tooth (5). Finite element method/analysis, as a numerical means of finding accurate answers to different questions was introduced less than a century ago, this method has proven its efficiency in different scale of questions in aerospace industry (6-10). Considering the prevalent usage of splinting, the aim of the study carried out was to analyze the distribution of stresses in the PDL of the mandibular anterior incisors with different bone loss levels after being splinted. We designed four 3D computer models of six anterior teeth in SolidWorks 2010 (SolidWorks, Concord, Massachusetts, USA). We designed different levels of anterior bone heights from normal to 5 mm of bone loss. The models were transferred to the ANSYS Workbench Version 12.1 (Ansys Inc., South pointe and Canonsburg, PA, USA). The mesial and distal surfaces of the models were restricted from displacements. Mechanical properties were defined according to Table 1. The models were meshed between 14385 and 15895 nodes and 8850 and 9650 elements. (Figure 1) The models were loaded with a 187 N force on the incisal edges of two incisors (Figure 2). The boundary condition was defined in a way to prevent the model from any rigid body motion. The stress in the PDL of the anterior teeth and also the labial displacements were recorded (Table 2). It started from 0.80594 MPa in normal bone height and decreased to 0.65085 MPa in five millimeter of bone loss in the central and lateral incisor. In canine, this finding was 0.45022 MPa in normal bone height and increased to 0.60226 MPa in five millimeters of bone loss (Table 1 and Figure 3). It was 0.047 mm in normal alveolar bone height in the central incisor; 0.044 mm in the lateral incisor and 0.033 mm in the canine. This changed to 0.118 mm for the central incisor, 0.107 mm in the lateral incisor and 0.079 mm in the canine with five millimeter of bone loss. All displacements took place in the incisal edge of the tooth in form of tipping (Table 3 and Figure 4). Any force applied long enough to the teeth can move them. It is the principle used in orthodontics to correct dental malposition by using various appliances that apply “controlled” forces. If teeth move, that means that a force is acting on them. This force can come from orthodontic appliances during treatment or various sources after treatment such as outside forces of variable intensity that cannot always be predicted or controlled and that could have an effect on the position of teeth like facial musculature, masticatory forces, tongue and lip pressure, etc., so one of an important part of the treatment is retention at the last part of the treatment. An alternative for removable retainers is splinting teeth. Recent reports have suggested that in order to prevent the changes after treatment, long-term retention is needed. One kinds of the splints used in orthodontics are made of composites and multi strand orthodontic wires which provides esthetic and efficient retention (11). In this study we aimed to analyze the distribution of stress in splinted mandibular incisors after orthodontic treatment, with different bone levels, and the influence of the forces in the labial movement of those teeth. Four three-dimensional finite element models (3D) were designed of mandibular six anterior teeth with their supporting tissues at different levels of anterior bone heights and with a bonded lingual fixed retainer. Four periodontally compromised incisors and two canines with optimal bone support were designed in the model. Vertical loads were applied, and 3D finite element was used to evaluate stress levels around the periodontal structures and teeth. 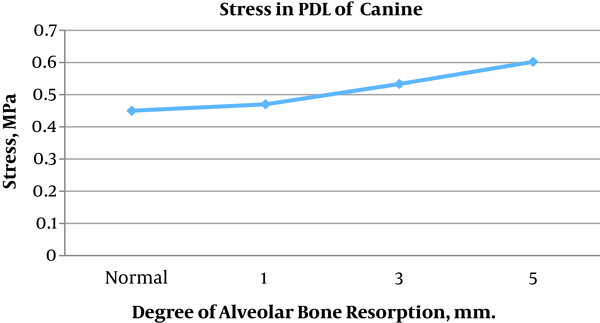 The results showed that the less bone levels around incisal teeth caused the more stress on the canine. This pattern of distribution can be considered to be due to splinting. In the other hand increasing the stress at the cervical margin of the teeth caused tipping movements in the all sampling points and at all stages of alveolar bone loss (12). Bone loss replaces the center of resistance toward the apex, and our results showed that the level of the bone loss influenced the degree of tipping in teeth for a constant applied force (6). Splinting after orthodontic treatment distribute the forces between teeth, so stress production on the healthy canine increases while it splinted with low level bone incisors, and this bone loss would change the center of resistance toward apex that causes tipping movements in reply to increased forces. Authors' Contribution: All the authors cooperate in the litrature review , research process and writting the article. 1. Riedel RA. A review of the retention problem. Angle Orthod. 1960;30:179-99. doi: 10.1043/0003-3219(1960)030<0179:AROTRP>2.0.CO;2. [PubMed: 13741513]. 2. Soares PB, Fernandes Neto AJ, Magalhaes D, Versluis A, Soares CJ. Effect of bone loss simulation and periodontal splinting on bone strain: Periodontal splints and bone strain. Arch Oral Biol. 2011;56(11):1373-81. doi: 10.1016/j.archoralbio.2011.04.002. [PubMed: 21550587]. 3. Gher ME. Non-surgical pocket therapy: Dental occlusion. Ann Periodontol. 1996;1(1):567-80. doi: 10.1902/annals.1996.1.1.567. [PubMed: 9118270]. 4. Melsen B, Agerbaek N, Markenstam G. Intrusion of incisors in adult patients with marginal bone loss. Am J Orthod Dentofacial Orthop. 1989;96(3):232-41. [PubMed: 2773869]. 5. Wakabayashi N, Kondo T, Yahagi R, Suzuki T. A patient-based model study of fixed splinting of premolars with reduced periodontal support. Int J Comput Dent. 2010;13(4):317-30. [PubMed: 21323012]. 6. Geramy A. Alveolar bone resorption and the center of resistance modification (3-D analysis by means of the finite element method). Am J Orthod Dentofacial Orthop. 2000;117(4):399-405. [PubMed: 10756265]. 7. Geramy A. Stresses around a miniscrew. 3-D analysis with the finite element method (FEM). Aust Orthod J. 2009;25(2):104-9. [PubMed: 20043543]. 8. Geramy A. Optimization of unilateral overjet management: three-dimensional analysis by the finite element method. Angle Orthod. 2002;72(6):585-92. doi: 10.1043/0003-3219(2002)072<0585:OOUOMT>2.0.CO;2. [PubMed: 12518953]. 9. Alikhasi M, Siadat H, Geramy A, Hassan-Ahangari A. Stress distribution around maxillary anterior implants as a factor of labial bone thickness and occlusal load angles: A 3-dimensional finite element analysis. J Oral Implantol. 2014;40(1):37-41. doi: 10.1563/AAID-JOI-D-10-00198. [PubMed: 21787209]. 10. Geramy A, Ghadirian H. Comparison of methods used to correct a lingually tilted mandibular molar: 3-D analysis using the finite element method (FEM). Aust Orthod J. 2008;24(2):96-101. [PubMed: 19113073]. 11. Bearn DR. Bonded orthodontic retainers: A review. Am J Orthod Dentofacial Orthop. 1995;108(2):207-13. [PubMed: 7625397]. 12. Geramy A. Initial stress produced in the periodontal membrane by orthodontic loads in the presence of varying loss of alveolar bone: A three-dimensional finite element analysis. Eur J Orthod. 2002;24(1):21-33. [PubMed: 11887376].